Intel was originally going to launch their first 32nm products from the Westmere family on Thursday at the 2010 International Consumer Electronics Show. A big keynote speech by company President Paul Otellini was heavily hyped as “a major news event”, and would’ve officially launched the desktop Clarkdale and mobile Arrandale CPUs. That speech will still happen, but most of the details that enthusiasts have been waiting on are now available, including pricing. There will be seven Clarkdale CPUs and eleven Arrandale CPUs at launch, along with seven new chipsets. Sadly, none of the new chipsets feature support forUSB 3.0 or 6Gbps SATA, but motherboard manufacturers or Original Equipment Manufacturers may opt to add those features themselves. The Westmere family is primarily a dual-core 32nm die shrink, but also features an integrated 45nm graphics chip on the same package. The integrated memory controller moves from the CPU die to the GPU die, which will boost memory access for graphics at a cost of higher latency for regular applications. There are also new instructions that will help with the encryption and decryption of data based on the Advanced Encryption Standard, named appropriately AES-NI. Most of the new CPUs will feature Turbo Mode, which enables a dynamic overclocking of a core when only single-threaded applications are running. This enables the maximum performance available while staying within the Thermal Design Power (TDP). The frequency of the GPU in Arrandale CPUs can also be boosted in a similar fashion. Intel’s Hyper-Threading technology is also used in most of the Westmere chips to increase the productivity of each core. Intel’s newest chips will be targeted squarely at mainstream consumers, as most enthusiasts will stay far away from integrated graphics. The exception will be in the mobile market, thanks to ATI’s switchable graphics technology. That will enable the use of the integrated graphics chip for less demanding graphics tasks at low power levels, but can dynamically switch to high performance discrete graphics chips for better performance when plugged into a socket or when selected by the user. ATI is expected to release a new series of 40nm mobile DirectX 11 graphics chips on January 7th to accompany the official Arrandale launch. Moving the graphics chip on package means that Intel can eliminate the traditional Northbridge chip and its cooling, thus lowering costs for OEMs significantly. Eliminating such a large chip means that smaller motherboards are possible, in exciting new form factors. 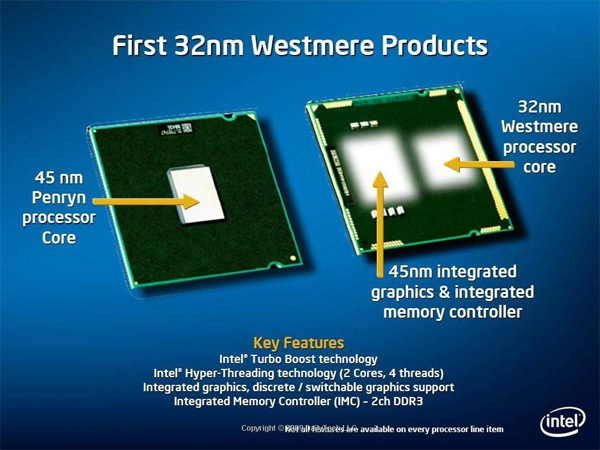 Westmere chips have been in mass production since September at Intel’s D1C and D1D fabs in Hillsborough, Oregon using the new P1268 process. The company had been stockpiling chips in anticipation of demand, and sent the first batches out in November to OEMs for inclusion in the latest computer models that will be going on sale this week. Enthusiasts will have to wait until the end of the year for the next-generation Sandy Bridge architecture for 32nm quad cores, but there will be a six-core 32nm Clarkdale-based chip codenamed Gulftown that will be available in the second quarter.